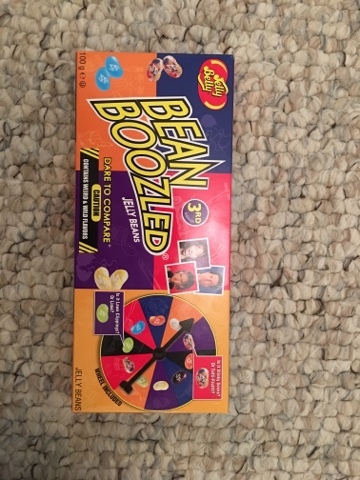 For New Years this year we were visiting with friends and they had a box of those Harry Potter influenced evil flavoured Jelly Beans. This particular batch are the third edition by Jelly Belly, and the idea is as follows. You spin the spinner to chose a random colour, you then select a bean and it's either a nice flavour, or it's evil twin. There is no board, no points and no overall winner, but it behaves like a drinking game but suitable for children and those who aren't fussed about competitive drinking. The box is very simple - spinner and beans - but as we were playing mini games on the WiiU we added the rule that every last place or zero score earned a spin. This added a little bit of jeopardy to the proceedings as you can see from the selection of flavours. 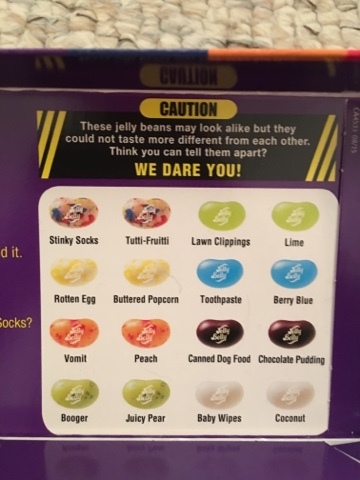 The worst I had was the rotten egg one, which was basically sulphur, and I'm not sure whether the green one I disliked was booger or pear, but I kept getting that too. The toothpaste/blue berry was pretty nice really in both forms and baby wipes/coconut was edible too. I managed to only get Tutti-fruity on that option, which was a relief as the stinky socks was essentially cheese. 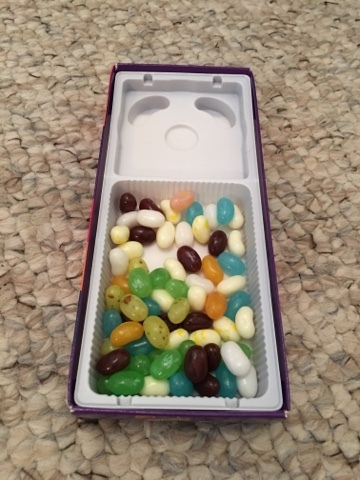 The authentic flavours of Jelly Belly really do add to the experience here - it's truly traumatic and if Bertie Botts Everyflavour Beans were anything like this then their fearsome reputation was well deserved. And a Happy 2017 to all our readers, may all your snacking be as varied as this box of beans, but with less nasty surprises.